Certain types of materials, like linoleum, are susceptible to mold infestations. Linoleum is a very sturdy material, however, if it isn’t regularly cleaned and sealed formations begin to take hold. It’s important to clean and remove mold under linoleum flooring as soon as you notice it. Otherwise, infestations can cause serious health hazards for anyone living in the building. Different types of mold can grow on a number of surfaces. The three most common types of mold found in homes are Aspergillus, Cladosporium, and Stachybotrys. Aspergillus is a mold commonly found in foods and in AC units. Cladosporium typically grows in air ducts and bathrooms. These types of mold can cause minor allergic reactions in humans and animals. 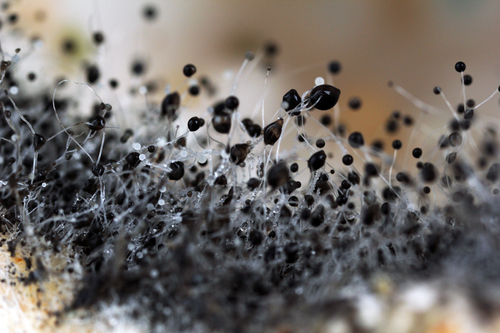 Stachybotrys, also known as “black mold”, is commonly found on carpet, linoleum, insulation, drywall and other surfaces. In small amounts, mold exposure isn’t regarded as a health issue. However, if mold growth continues unmanaged the results could be harmful to you and your family. This is why it is vital that individuals clean their homes and attempt to remove any mold under linoleum. These effects can be disastrous to expectant mothers, the elderly and young children. If you are concerned for your health after exposure to large amounts of mold, please consult your doctor. Step 1. Remove any sources of moisture in the infested area. The EPA even states that the best way to control mold growth is to remove moisture buildup in the building. If there is water damage in your home, then you will need to fix the damage to get rid of the mold. Step 2. Seal off the rest of them home. HGTV recommends the use of heavy plastic to seal off doorways and entrances leading to the room with the infestation. You need to do this to stop the mold from spreading to the rest of the home. Use duct tape to secure the heavy plastic on the doorways and entrances. Step 3. Get up and Suit up. For the next step, you’ll have to put on a few things to protect you from the mold. Put on a facemask or respirator. You’ll also want to put on protective clothing, which will prevent mold spores from landing on your body. This means covering your head, legs, and arms. Make sure you are thoroughly protected before moving on to the next step. Step 4. Cleanup on Aisle 4. Grab a sponge and some heavy-duty soap to clean any mold you can see. Then use mold removal products found at your local hardware store. These commercial products will be sure to kill off any mold it comes in contact with. Be sure to clean the surrounding areas, because they may have mold infestations that aren’t visible yet. After you are done, you’ll want to put all of the materials you used in the garbage. Don’t reuse any of the protective clothing or sponges. Locating and cleaning mold under linoleum is no easy task. Sometimes the infestation of mold under linoleum is so severe that you have to get rid of the entire floor. If that’s the case, then give us a call at 866-883-8783. We get rid of any harmful residues, chemicals or even molds in the buildings we clean. Our team at DustBusters is committed to safely removing and cleaning floors in an efficient manner.